Progressive activists are calling on candidates to explain how they will keep their promises. 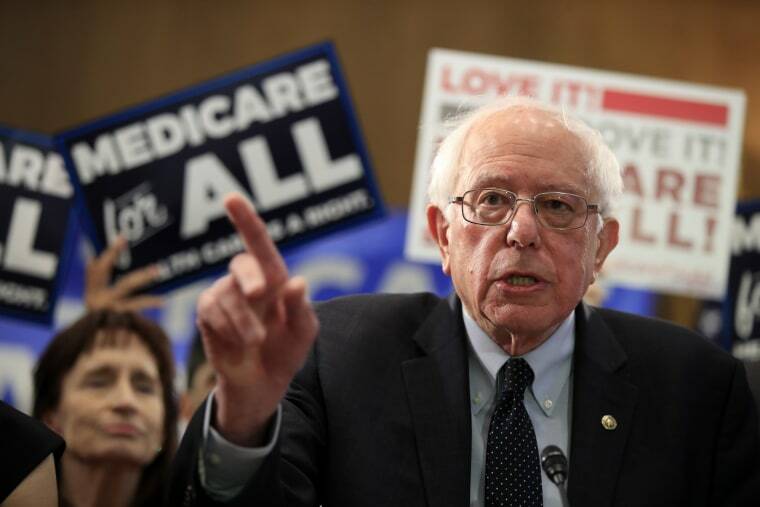 WASHINGTON — Sen. Bernie Sanders unveiled the latest version of his "Medicare For All" bill on Wednesday — but a split in the field of Democratic presidential contenders over how to pass it is giving rivals a rare chance to outflank him on the left. Sanders' legislation is broadly similar to prior versions: It would effectively replace all insurance with a more generous version of Medicare that covers every American with no copayments or deductibles. The updated bill adds new benefits for long-term care to help seniors remain in their homes and communities. "We are going to end the international embarrassment of the United States of America, our great country, being the only major nation on earth not to guarantee health care to all as a right," Sanders said at a press conference. The Sanders bill is the definitive leftmost position on health care for 2020. Several presidential rivals, including Sens. Elizabeth Warren, Cory Booker, Kirsten Gillibrand and Kamala Harris are among 14 senators co-sponsoring it, but their campaigns have largely pivoted toward discussing more incremental plans that preserve private insurance. Gillibrand joined Sanders at the podium on Wednesday, but used her remarks to talk up her proposal to let customers buy into Medicare and then "dare any insurance company to just try to compete." In the Sanders bill, these insurers would be banned from offering similar coverage within four years. As candidates promise ambitious new policy ideas, though, progressive activists are also grilling them over whether they have a plan to get their proposals past GOP opposition in Congress and conservative justices on the Supreme Court. Warren has seized on the issue by calling for an end to the filibuster, the Senate rule requiring 60 votes to pass a bill if a member objects. Republicans currently control the Senate and election analysts give Democrats, at best, a shot at winning a slim majority in 2020. "We're fighting for big, structural change — but we won't get anything done unless we face this head on," Warren tweeted. That was a contrast to Sanders, who to that point had taken a bold approach to policy, but a more measured one when it came to legislative procedure. Sanders has suggested he favors "filibuster reform" but sounded skeptical in an interview with Huffpost over the weekend about proposals to abolish it. He noted that President Donald Trump favored eliminating the filibuster, which should make Democrats "a little bit nervous," and that "you have to protect minority rights” in the Senate. "I don’t think you can just simply shove everything through," Sanders said. "There's an argument for that, by the way, but that's not where I am right now." Those comments drew criticism from progressive circles where his policy ideas are often best received. "It's befuddling that Bernie doesn't have a stronger position on filibuster reform considering how much he criticized the GOP's use of the filibuster for blocking Democratic legislation in 2013," Waleed Shahid, communications director for Justice Democrats, told NBC News. "Maybe he just thinks this is an arcane issue that the vast majority of voters don't understand or care about," Shahid added, "but I think he can use his platform to explain to people why a political revolution also requires major structural reforms of our democracy." Looking to address these concerns, Sanders released a statement on Wednesday afternoon detailing a path to passage that involved first rallying supporters to pressure Democrats into supporting his plan and then using potential hardball procedural tactics to pass it with a bare majority. Sanders suggested making it harder for Senators to filibuster, while not quite calling for its abolition. But he also indicated that ending the filibuster would be unnecessary, as he could pass his agenda through budget "reconciliation," a procedure that requires a simple majority. But reconciliation comes with constraints. Budget experts interviewed by NBC News were split on how much of Sanders' agenda might pass given these obstacles. While expanding health care and raising taxes seem achievable to some degree, the bigger and more complex the proposal, the greater the risk that a crucial component might be stripped that undermines the whole package. In his statement, though, Sanders suggested a way to ensure that a Medicare For All bill made it past the Senate parliamentarian, who advises members on whether legislation violates the rules. He would instruct his vice president, who would preside over the senate, to overrule the parliamentarian's advice if it conflicted with his plan. "I can tell you that a vice president in a Bernie Sanders administration will determine that Medicare for All can pass through the Senate under reconciliation and is not in violation of the rules," he said. It's an idea that's been floated before: Senator Ted Cruz, R-Texas, suggested Vice President Mike Pence use the same method to repeal portions of the Affordable Care Act. The idea was rejected, however, and it could have far-reaching implications for how the Senate functions if ever implemented. Other candidates have set aside procedural concerns to argue voters should grill candidates more on what policies they'll pursue if they lack the votes for Medicare for All. "I think the best way to do it would be design a Medicare for All system," Booker, who also opposes ending the filibuster, said in an interview with WCBS 880 on Wednesday, "but anybody who says those words, 'Medicare For All,' who’s running for president, the next thing out of their mouth should be talking to people about well, if we have 50 (votes), If we’re a split Congress, what are you gonna actually do in your first year to make health care more accessible and affordable?" On the right and center-left, critics challenged the new Sanders bill over its cost — $32 trillion over 10 years, according to one estimate by the conservative Mercatus Center — and its elimination of existing private plans. Republicans have made single-payer health care an early focus of attacks heading into the 2020 election. "Self-proclaimed socialist Senator Bernie Sanders is proposing a total government takeover of healthcare that would actually hurt seniors, eliminate private health insurance for 180 million Americans, and cripple our economy and future generations with unprecedented debt," White House press secretary Sarah Sanders said in a statement. Americans spend far more per person on health care than other developed countries, and Sanders has argued his plan will save money by reducing overhead and provider payments and negotiating lower drug prices. He has not specified how he would pay for his plan, but offered a menu of possible options on Wednesday, including a 4 percent payroll tax on workers and 7.5 percent tax on employers, higher estate and income taxes on the rich, and new fees on large banks. Health care industry groups, who have launched a campaign to defeat Medicare for All, argue that cutting reimbursements could affect quality of care, potentially making it harder to recruit doctors and specialists and to keep hospitals open.